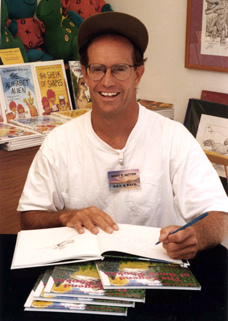 Children's book author Scott E. Sutton autographing books. This is the official web site of best selling children's book author, illustrator, and speaker Scott E. Sutton. Here you will find all the latest information about his children's books, children's artwork, and school visits. Scott's imaginative books feature colorful illustrations that capture the imagination of young children. And, because the stories are written in rhyme they are fun to read. Not only are Scott's children's books enjoyable to read, they also teach values that will stay with your child for a lifetime. For more information and to buy books, click on the images below. that teach common sense values. ages 3 to 9 years. as well as adults, too.